Roskilly farm back in Cornwall make the most amazing ice creams and my favourite of theirs is Orange & Mascarpone. It is so creamy and refreshing I can’t resist it if I see that flavour in the display freezer. I adore nectarines and eat as many as possible during their short summer season so thought nectarine & mascarpone ice cream was a way to prolong the nectarine consumption. 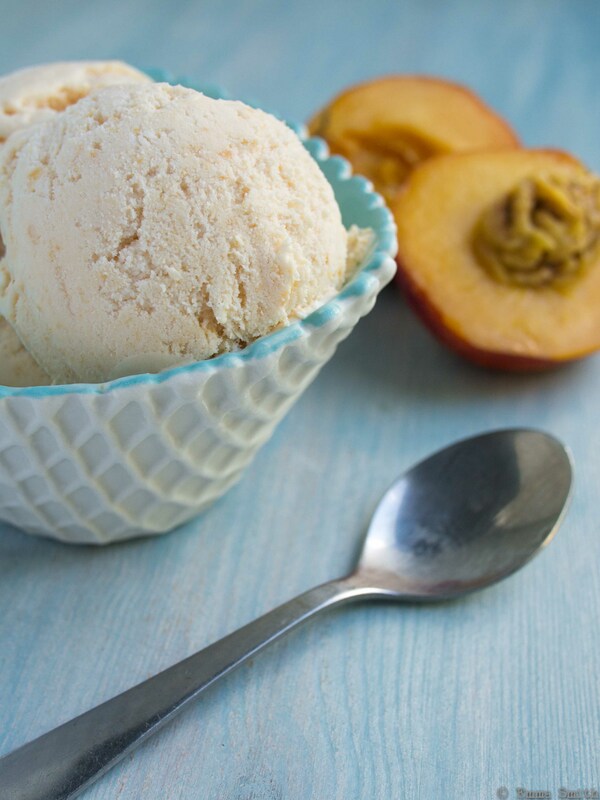 I used David Leibovitz’s Peaches and Cream recipe as inspiration and created possibly the creamiest ice cream known to man…….and I wonder why I have gained a few pounds since starting the blog?!? Cut the nectarines with a cross on the bottom and place in a bowl. Pour over boiling water and leave the nectarines for 5-10 minutes until the skin starts to peel away. Drain and refill with cold water and leave to cool until you are able to handle them and remove the skins. Cut into chunks over a nonreactive saucepan and discard the stones. Cook them with the water over a medium heat, covered, stirring once or twice, for about 10 minutes or until soft and cooked through. Remove from the heat, stir in the sugar and lemon juice then cool to room temperature. Puree the cooked nectarines and any liquid in a blender or food processor with the cream and mascarpone until almost smooth but slightly chunky.